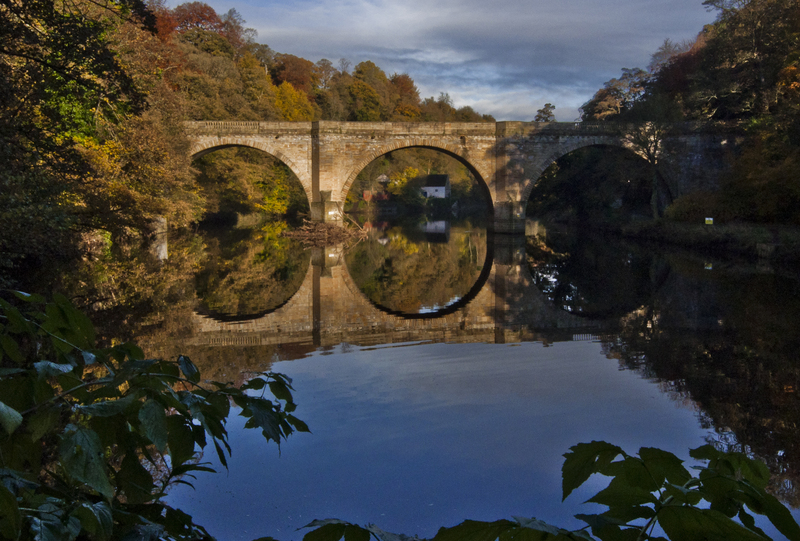 I was at the Durham Book Festival on Sunday and early on Monday morning I got up to get this shot of Prebends Bridge. Down by the River Wear there wasn’t a breath of wind in the air and I was lucky enough to get a bright hour about nine o’clock in the morning. It’s odd to be writing about windless days at the same time the eastern seaboard of the USA is being thrashed by Hurricane Sandy. There’s several fake photographs of that storm doing the rounds at the moment and some real ones too. The photograph is taken with a pretty quick exposure of 1/60sec and at f20. I would have liked to wait another 20 minutes for all the arches to be illuminated by sunlight as well as the squat white house in the distance that is framed by the bridge. But then I only had 20 minutes till my train would be pulling out of Durham Station, and at £129.00 a ticket to London (thank you East Coast), I really didn’t think it was worth missing. 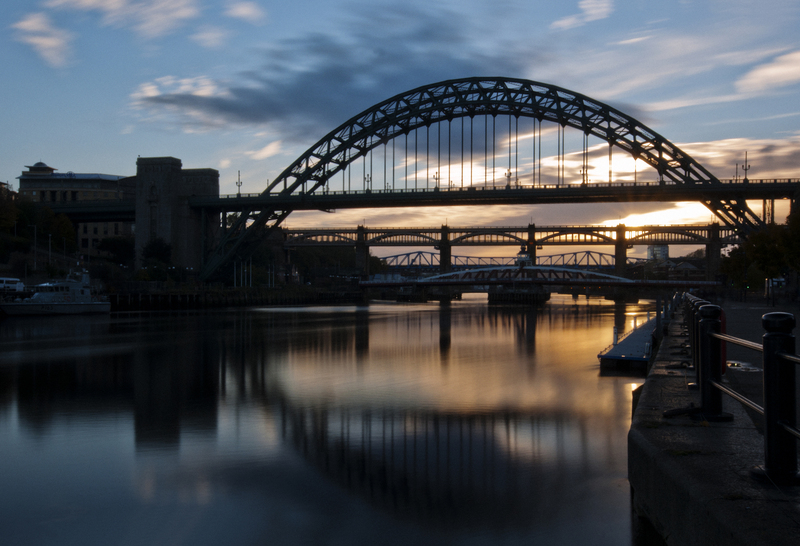 It was as still in Newcastle on Saturday night as it was in Durham on Monday morning. I took some reflection photographs there as well and now I’ve gone through and sorted them out I thought I’d add them below here too. 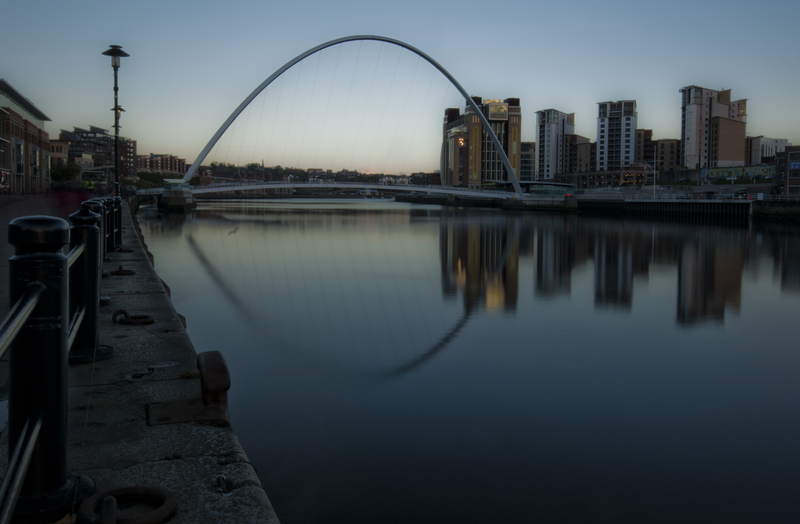 They were taken down by the Quayside in Newcastle and they show the iconic Tyne and Milennium bridges in the last of the afternoon sunshine. I think they’re better quality shots than that of Prebends Bridge above, but they’re taken with neutral density filters to allow for longer exposures and, as such, their calmness is more simulated than realistic – as it is on the one above. 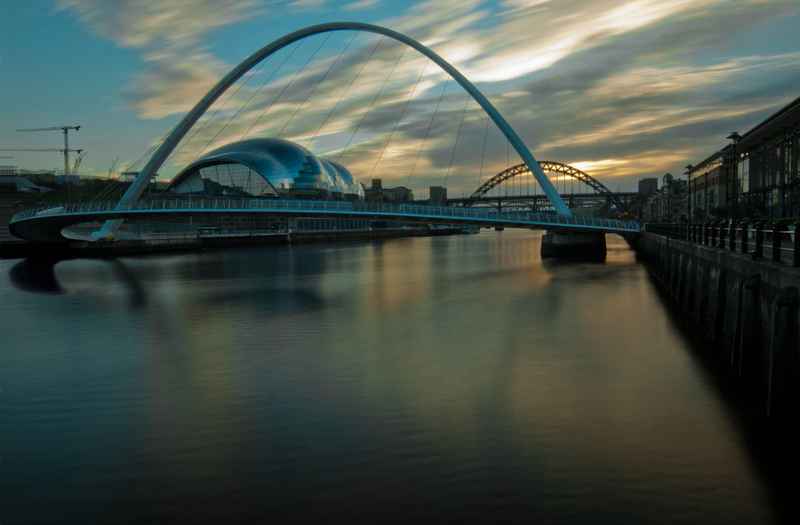 But nonetheless here’s some more north eastern bridges for you. They all conform somewhat to Orwell’s “utterly windless day” and for the moment I’ll keep my options open as which to select in the end.